CoastExchange was an on-line forum for climate change adaptation professionals, providing opportunities to share experiences and build networks. CoastExchange was an online forum being run by NCCARF as part of CoastAdapt. The forum was moderated on behalf of NCCARF by a consultancy, Scientell (http://scientell.com.au). Users were required to register to be able to post to the forum, making it a safe environment in which to share experiences and build networks. 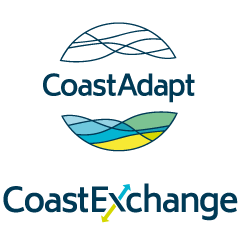 CoastExchange was the online discussion forum included as part of CoastAdapt. It ran from April 2016 through to June 2017 and had over 250 registered users. As well as providing a platform to discuss adaptation issues there were also daily news items, weekly feature articles and every month registered users submitted questions about coastal adaptation which were then answered by our panel of adaptation experts. The weekly feature articles and the expert questions and answers have been included in CoastAdapt and are available via the buttons below. What other climate adaptation forums are there? The forum is developed and maintained by the Stockholm Environment Institute (SEI). It is ‘an online “open space” on climate adaptation issues. It allows practitioners, researchers and policy-makers to access credible, high-quality information and connect with one another’. This network is aimed more at the developing countries and emerging economies in the Asia-Pacific region. Nevertheless, Australia is part of the region and can contribute and participate. APAN does not run a permanent forum. Rather it organises ‘The Exchange Series’, a series of distinct topics, with a lead scientist to kick off the discussion on each with an extended email. Each series runs for about two weeks. The Climate Adaptation Knowledge Exchange (CAKE) is managed by EcoAdapt. As well as providing case studies from around the globe CAKE also allows visitors to register and contribute to their community section.